Our Cahuita tour is known for being one of the best! Parque Nacional Cahuita has the largest system of Coral Reefs in Costa Rica. 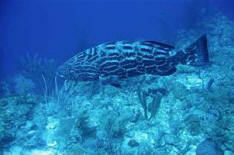 This includes 6 species of coral, tropical fish and the occasional sighting of a harmless reef shark or sting ray. The beach is shaped like a horse shoe, with the entrance of the park at one end and beautiful Punta Cahuita at the other. 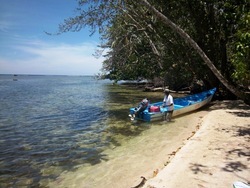 First, you will be picked up at your hotel and be taken to the village of Cahuita. There the captain and the guide will take you by boat to the coral reef, where you’ll snorkel for two hours in two different points of the National Park. Afterwards, we’ll head to the beach to rest and to snack on some tropical fruit. The little break at the beach is followed by a 1-hour guided hike in this wonderful coastal forest. 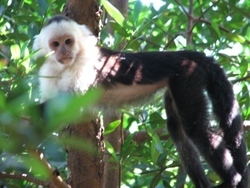 You might see monkeys, sloths, birds, poison dart frogs, iguanas and even sneaky raccoons! During the hike you will also learn about the history of Cahuita. At the end of the walk, the van will take you back to your hotel. Includes: Round-trip transportation, service of professional guide, gear, all entrance fees, fruits, snacks and bottled water.